The San Lorenzo yard based in La Spezia was founded at the end of the Fifties. It launched its first boat in 1960 and from then on it has been carrying out continued research projects the results of which may be noted today in the various characteristics of the San Lorenzo 108. The history of several Italian yards is printed on the most important pages of international yachting and one of them is the San Lorenzo yard. In fact, its boats are fully entitled to be included in the description of yachts that conquered the admiration of many yachting enthusiasts thanks to the introduction of important innovations. For further details and information contact Cantieri San Lorenzo; via Armezzone 3; 19031 Ameglia (La Spezia, Italy); tel. +39 01876181; fax +39 0187618316; website www.sanlorenzoyacht.it; e-mail: segreteria@sanlorenzoyacht.it. Today, the shipyard is located on the border between Liguria and Tuscany, two Italian regions that are among the most important berths of yachting. Each small detail is produced with care on its modern premises under the supervision of president Giovanni Jannetti. Everything is made inside the yard - from the arrival of the fiberglass till launching - which totals an average yearly production of approximately fifteen 22- to-33 meter units. The workforce includes 350 persons, including employees and collaborators. This important yard is attentive to the needs of the international market and it efficiently meets its requests. The San Lorenzo 108 we shall describe here is the final evolution of a range of deluxe motor yachts - resulting from the design and construction efforts of the yard - featuring very high aesthetic and technical levels. Thanks to the vast experience gained over almost 50 years of existence, the yard is able to adapt its megayachts to the needs of his clients both in terms of layout as well as in terms of engine installation. The 108, for example, may be fitted with MTU engines of the 396, 2000 and 4000 series and layout may be with four or five staterooms plus crew quarters - located in an independent area far from the Owner and his guests' activities. The Owner may also choose fittings and equipments from several alternative solutions so that the yacht is customized to his tastes and is not one of the many boats existing on the market. 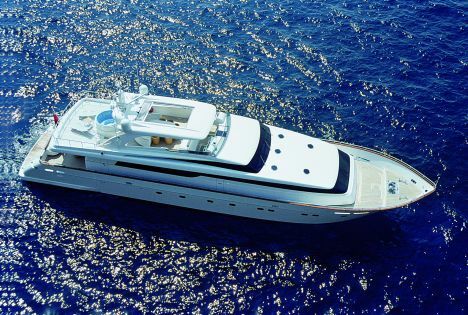 The San Lorenzo 108 design was developed by Della Rolle architects and by the yard's technical department, under the supervision of president Jannetti. Elegant and clean lines, typical of the San Lorenzo production, make it first of all a "San Lorenzo" and then a motoryacht. Thanks to the two powerful 12V4000M90 MTU engines, this 33-meter yacht reaches a maximum speed of 30 knots and a cruising speed of 26. The description of the engine room cannot be omitted: the hull breadth aft (7.35 m) allows not only to fit two MTU engines but also ample room for plant checking and monitoring using the various instruments that may be safely controlled even at sea. Outside, the flybridge is very spacious and is protected by a sliding electrically operated hard top that harmoniously fits in the profile of the yacht and is capable of shading the bridge living area. Within this structure, the yard created a very special lighting decoration capable of offering an enthralling atmosphere at night. Maneuvers in small spaces are facilitated by the excellent view on both sides of the two wheel stations. 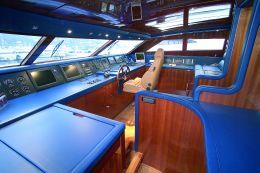 The indoor wheel station is located on the intermediate deck, between the flybridge and the main deck. 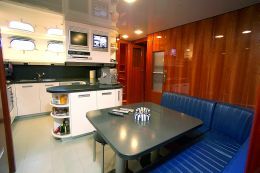 It is as spacious as that of bigger yachts and it is fitted with wide windows, a central ergonomic armchair and wheel and a large dashboard, fitted with all necessary instruments for yachts of this size. 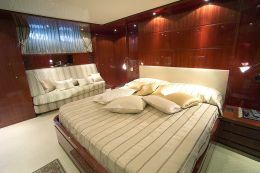 Here the style is modern and materials and colors are in line with the yacht's interiors. As for the outside, the aft platform needs special attention. 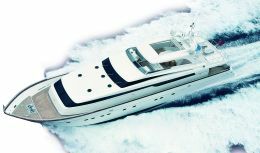 It is accessed by way of two proportionate side ladders and it is in line with the design of the yacht's aft structure. Thanks to the wide breadth aft, this area offers a series of alternative functions such as tender launching and hauling, access to the engine room by way of two watertight doors and easy access on board. The interior layout meets at best the Owner requests thanks to the hull size. 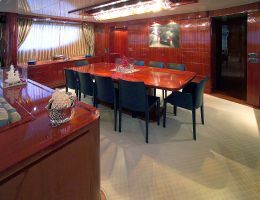 The Owner stateroom is on the main deck forward and takes advantage of the hull breadth; from there an excellent view of the sea is offered thanks to the ample windows. 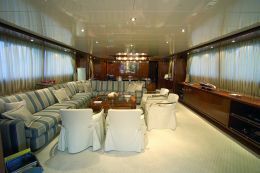 Aft of the Owner's suite there is the salon divided into two interconnected areas, one is the sitting room with sofas and coffee tables and the other one is the dining room. 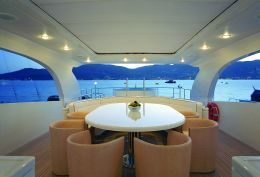 From here one can access to the middle deck where there are the wheelhouse, the kitchen and the crew quarters. 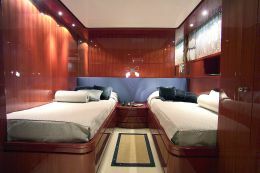 The lower deck houses a very comfortable VIP stateroom forward, a twin-bed cabin and a large single-bed cabin. Amidships there are the crew quarters: the captain's cabin, two double cabins for the mates, the kitchen and a service room. 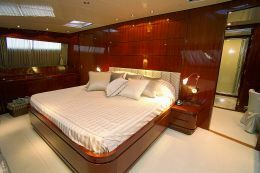 Interior décor is in glossy striped makore mahogany, which highlights the yacht's sober and cozy style.